The Modernist sculptor Constantin Brancusi famously said “architecture is inhabited sculpture”. His phrase draws a direct comparison between the two three-dimensional disciplines and invites speculation about the inherent relationship between them and the open spaces between. The question is addressed through photography by Fabrice Fouillet, who trolls the planet with his camera in order to document to what extent architecture can bear the symbols of a particular culture. 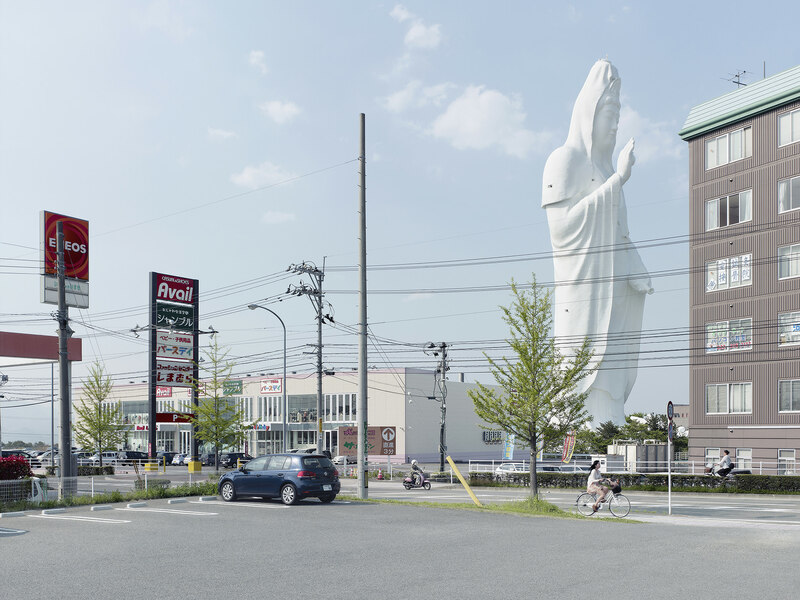 One of his most well-known series, Corpus Christi, focuses on a very specific niche of the religious architecture (the modernist churches that were built mainly in Europe in the ’50s and ’60s), while his latest project, Colosses, is a worldwide study of the landscapes embracing monumental commemorative statues. You point your attention on situations permeated by a strong spiritual dimension. Where does this interest in transcendental places come from? Actually, I am not specifically looking for “metaphysical” projects. I am more interested in the visual impact that a particular topic can provide. At the moment, the recurrence of the spiritual dimension is almost a coincidence. So what brought you there? I work a lot by following the intuition. The main motivation at the beginning originates from pure photographic attraction, because it is fundamental to take pleasure while shooting. Obviously, the story must have an interest for the public and this is a question I always ask to myself before starting. I like the conceptual part as well, but it generally comes after. The churches you depict in Corpus Christi are characterized by the fusion of their majestic verticality and strong solemnity with the futuristic use of structures and materials – a combination that you decided to transmit by adopting a rigorous system and a neutral point of view. What else can you tell us about this choice? Following what we were saying before, the aspect that mainly inspired me in developing Corpus Christi was the aesthetical and graphic nature of the buildings. I am keen on architecture and I think that these new places of worship designed by great architects are absolutely fascinating from the spatial and volumetric point of view. That’s why I find their interest on the photographic level simply obvious. When I started, I was thrilled to understand how to explore this subject; in the end, it turned out that the best solution to build a consistent series was to adopt the same point of view by putting the altar at the bottom of the picture, in order to allow to contemplation of the architectural work in its entirety. 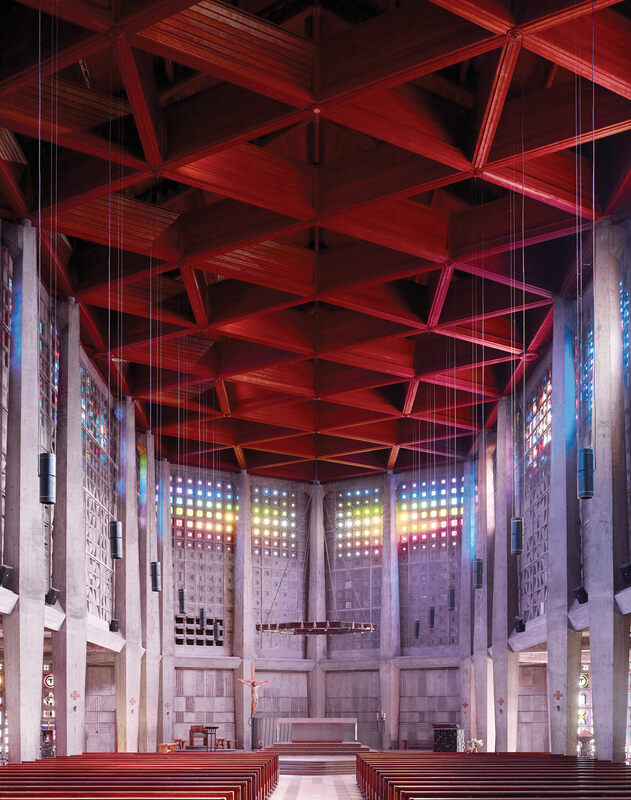 That’s right: if these churches represent a genuine inspiration in modern architecture, they also symbolize a break with the traditional imagery of Christianity. It was an unavoidable aspect that gained importance in a second time, making the subject even more interesting to me. In this case, the aesthetic and historical dimensions are strongly related: no way to photograph these buildings without evocating their meaning on the social level. Once again, the format responds to the intention, since the framing symbolically confronts the power of the sacred to the human condition. Also Colosses deals with the cult theme on a larger perspective by encompassing the civil and political celebration, beyond the religious one. The point of view is wider too, and includes the context in which the object of veneration – in this case, the statue – is located. The result is often so estranging to the point of asking oneself if the depicted situation is real or a fake. Is the creation of such an ambiguity just a side effect, or it is what you were looking for? I was looking for an unexpected point of view: I wanted to observe how these huge symbols are taking place in the landscape, despite of their traditional social function. Most of the time, to show them out of their formal surroundings is a way to enhance their intrusive manifestation in the landscape. As a consequence, in order to suggest the entity of the disproportion to the viewer, I had – once again – to confront the greatness of the symbol, given by its giant physical dimensions, to the human scale. Actually, I can say that the whole project is about this disproportion, more than about the weirdness of the situation. Fabrice Fouillet, Colosses. Dai Kannon, Sendai, Japan. 100 mt, built in 1991. Though, it’s undeniable that the places you photograph are often surreal, endowed with an almost dystopic charm. How do you find them? How much is the research phase influential, in your job? Even if curiosity is favourable to inspiration and ideas sprout mainly from my passions, research is quite a big part of my job. It has the power to confirm or abort an intuition. For Colosses and Corpus Christi, in particular, the research phase before shooting was huge! I really had to hunt for the places, in the proper sense of the term. Once I had tracked down a spot with that matched the requirements, I had to estimate if it was visually interesting; if so, I passed to the logistical phase: is it accessible? In which conditions? And so on. Generally speaking, it is crucial to reduce the risk of mistakes before travelling, but bad surprises can always happen. Architecture photography, in which you position a big part of your work, is a linguistically standardized sector that is highly conditioned by the technique. How do you manage to conciliate the practical restrictions with your expressive needs? Actually, if architecture photography is dependent on the technique, I don’t really feel it as a limit. I could even say that those technical considerations correspond to my expressive needs, since I like the rigorous settings that this kind of photography imposes. But this is a very personal point of view. Anyway, there’s not only one way to take pictures and each practice his art as he wishes: a picture of architecture may be a good image even if it does not meet certain technical requirements.